Real Homes 1.5.1 newest version : Released on June 16th, 2014. Advance Search Form — Real Homes Theme now supports more search fields. Search fields can be added and removed from theme options. For more information please view Related Screenshot. User Login & Register — Real Homes Theme provides User Registration, User Login and Password Recovery features. Please try the demo for real experience. Front End Property Submit & Edit — Real Homes Theme provides Front End Property Submit feature. A user can view his submitted properties and later on modify the property information, if required. PayPal Payments for Submitted Properties — Real Homes Theme provides PayPal payments integration for submitted properties and if enabled from theme options a property will be automatically published after successful payment. For more information please view Related Screenshot. Website administrator can also view the list of payments with related details. Easy & Extensive Theme Options — Real Homes theme has very easy and comprehensive set of theme options that will help you configure and modify the things around your website more easily. For more information please view Screenshots. Responsive Layout — Real Homes Theme is built in twitter bootstrap and it has responsive layout with full width slider. So, it looks awesome on big screens as well as on smart phones and tablets. Search Engine Optimized — Real Homes theme is fully hand coded and its HTML is written keeping in mind your sites good ranking on search engines. The theme has good use of h1,h2,h3 tags. The primary contents are above the secondary contents in markup. Various widgets in sidebar provide very good internal site linking. 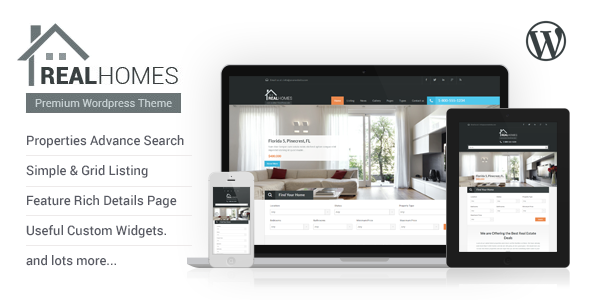 WPML Compatible — Real Homes Theme supports WPML plugin. So, You can launch your website in multiple languages. * Added checkbox to mark a property as featured in submit property template.